Textiles are as old as the hills. Textile fiber can be braided, hooked, woven, felted, and used to create in a multitude of ways. 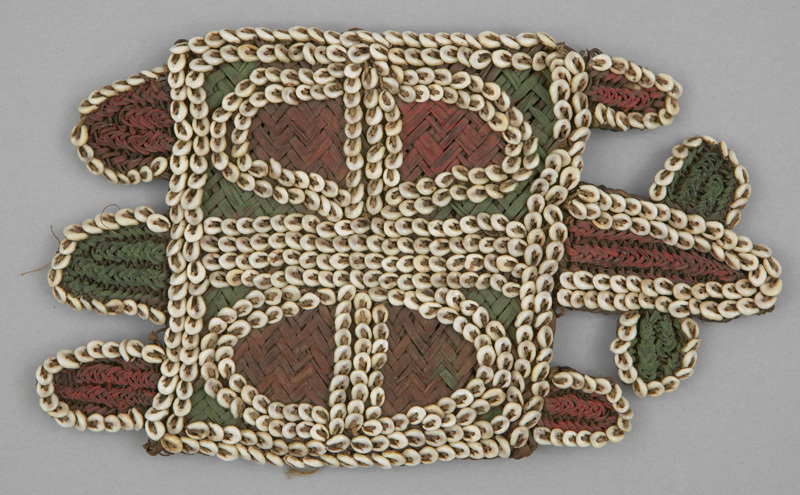 But even as far back as the first millennium, in the Andes of South America and during the time of the Incan empire, knotted textiles were the primary counting and communication device. 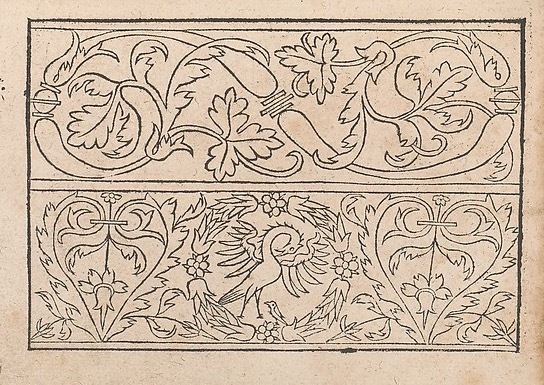 These “talking knots”, or “knot records” were called quipus. There are good records of quipus from the first millennium through the 1500s, and ethnographers have unravelled their secrets, by and large. The fibers were either spun and plied thread such as wool or hair from alpaca, llama, guanaco or vicuña, or, more rarely, from cotton. Some of the knots, as well as other features, such as color, are thought to represent non-numeric information, but these secondary elements have not yet been deciphered. 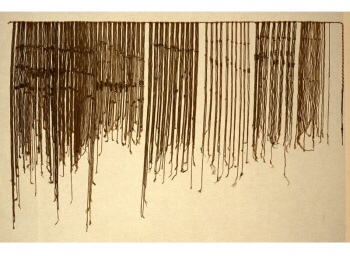 Similar systems of counting were used by the ancient Chinese and native Hawaiians, and there is even a similarity to the bead-counting of wampum, in Native American culture. But quipus were a quite advanced system. The type of knot, the position of it on the string, the total number of knots and the sequence of the knots could all combine to create a potentially huge number of meanings. The whole method was based on a decimal system, like ours, with the largest decimal used being 10,000. 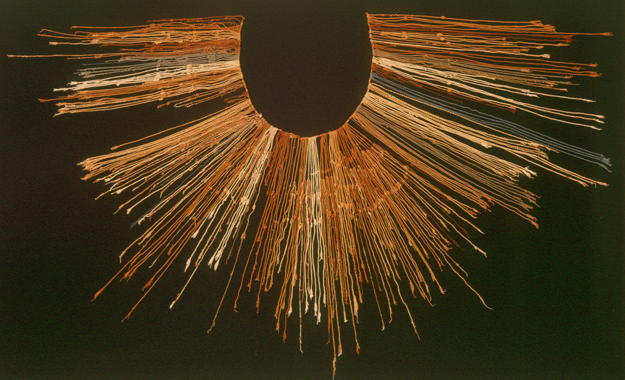 The Quipucamayocs (“quipu-authority”), were the accountants, those who created and deciphered the quipu knots. Quipucamayocs, once trained, could carry out basic arithmetic operations, such as addition, subtraction, multiplication, and division. They kept track of taxation, the type of labor being performed, maintained a record of economic output, and ran a census that counted everyone from infants to “old blind men over 80”. 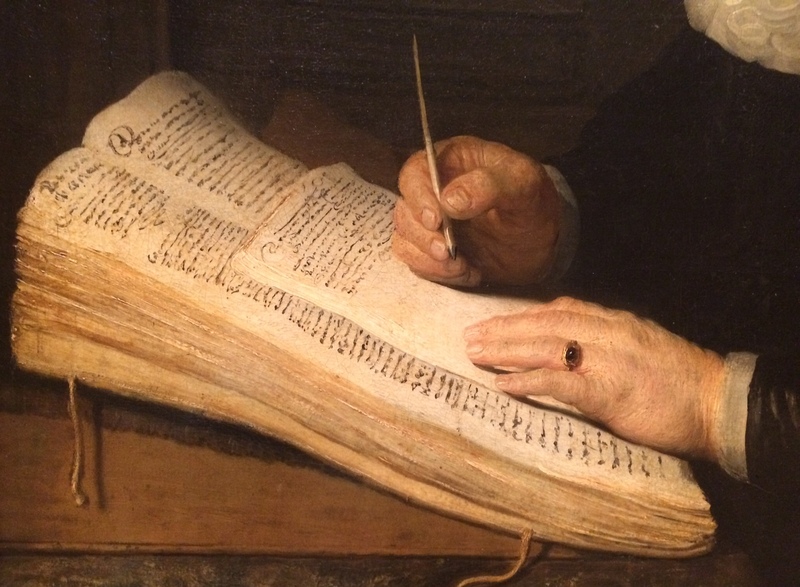 The system was also used to keep track of the calendar. 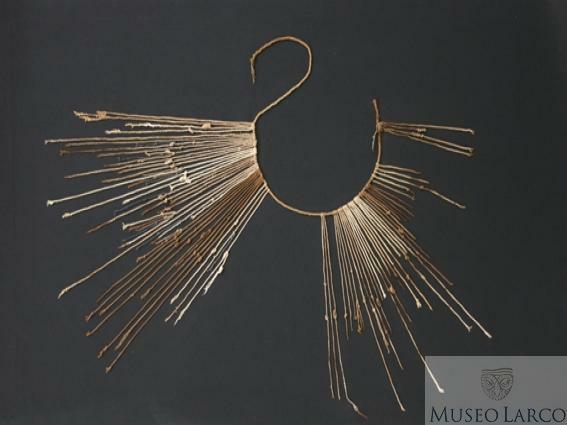 According to one authority, quipucamayocs could “read” the quipus with their eyes closed. Does this have to do with rughooking? Well, no. 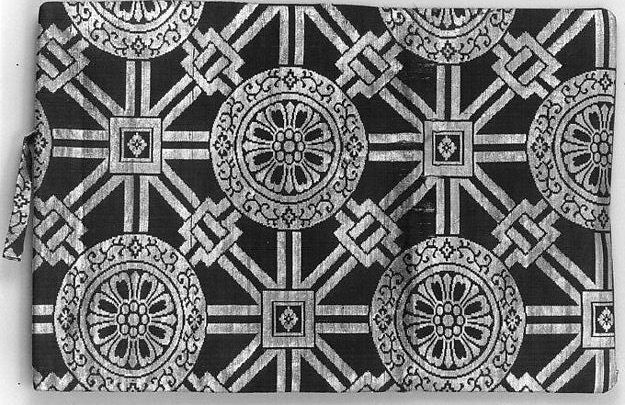 But it is a pretty fascinating and elegant use of textiles as a complex code, and as textile artists, something good for us to know about! 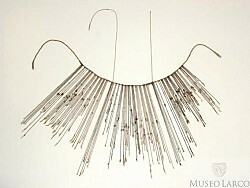 For more pictures of quipus, go to www.museolarco.org and if you would like a more technical explanation of the counting system of knots, look to this article in Wikipedia, or this good general article from the Ancient History Encyclopedia. Rejoice in your work, and hook on! 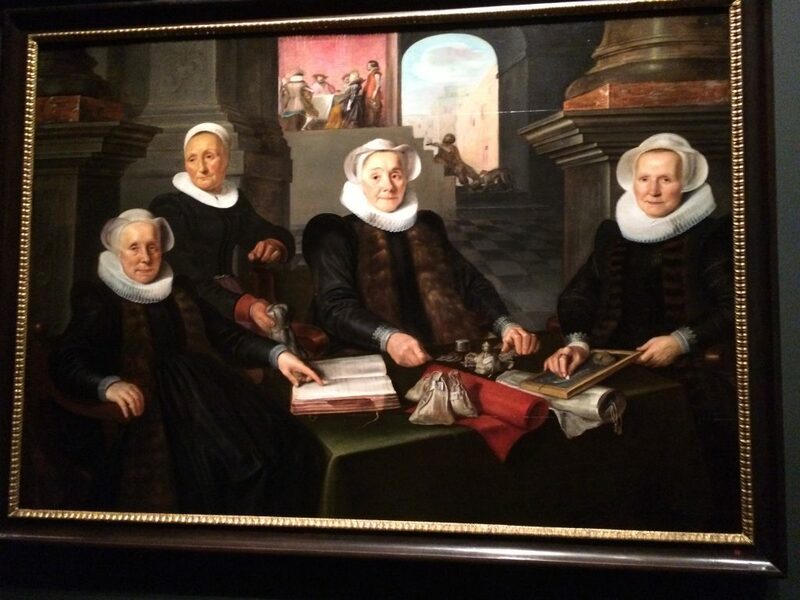 These women were most often the directors of charity groups, running hospitals, poorhouses, schools. Men would oversee the finances of the institutions, but these women ran the day to day functioning, and had veto power over all decisions. And the effect of this not only gives him prominence, but it makes us continually look around at the others in the canvas. What’s going on here? Who is that guy looking at, who is this fellow talking to? What is this guy pointing at? It definitely adds movement to the composition. It took me a minute or two to realize what kept my eyes moving around the canvas, and why I kept returning to the guy down in front, who was looking straight at me! Very nicely done, and one more good memory to end a busy week in Amsterdam. 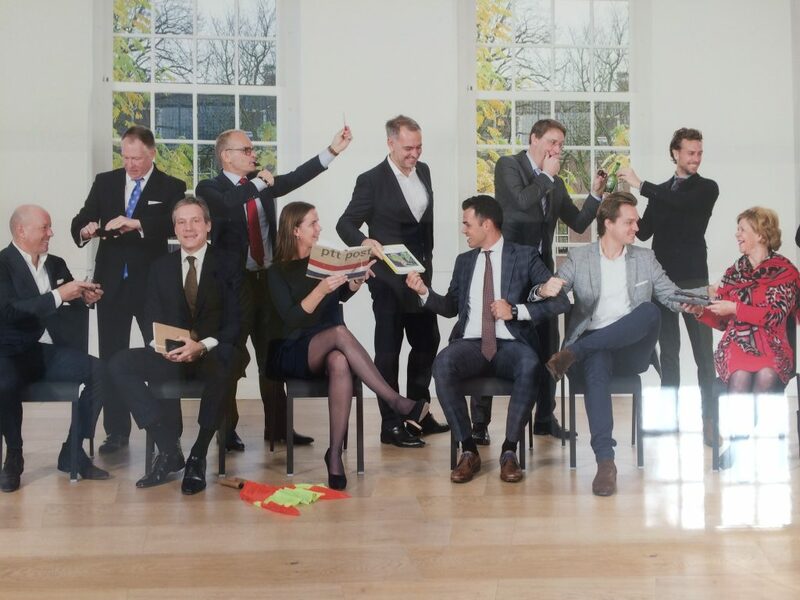 Tot ziens! 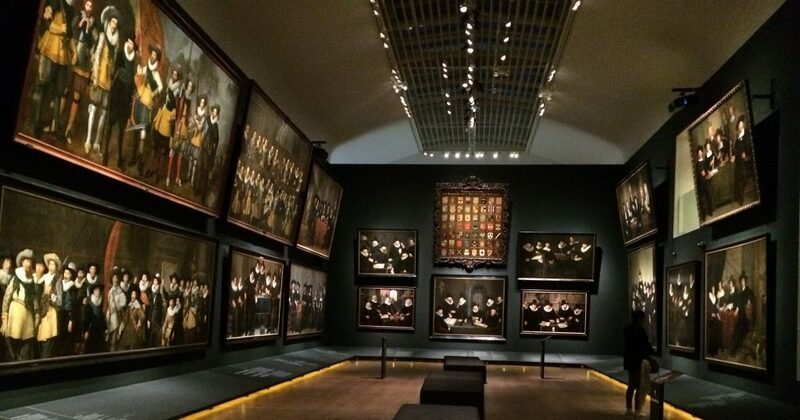 After a day at the Rejksmuseum, I can only say oh my! Oh my! I am on art overload. I took so many photos that my phone battery started declining rapidly! 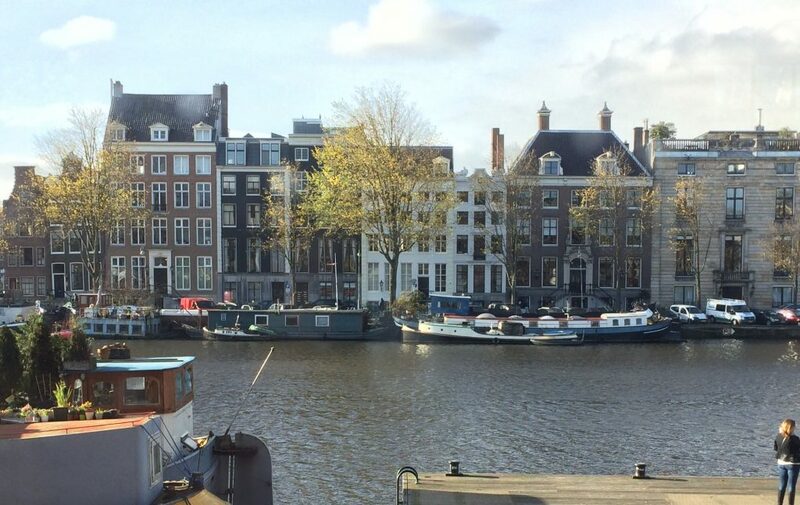 First, the photo above is just a view from one of the canals I passed on the way. 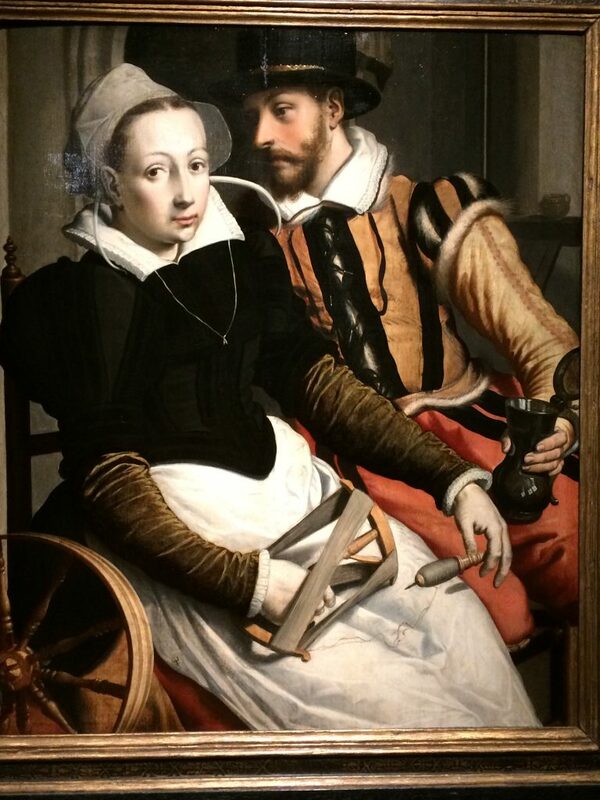 The curator label said the portrait carries a clear message – as she looks directly at us, she is having to choose between virtue (the spinning wheel) and vice (the suitor with the tankard). The Syndics were elected for a year, to inspect the quality of dyed cloth, comparing the color of each batch to the official samples of each color. 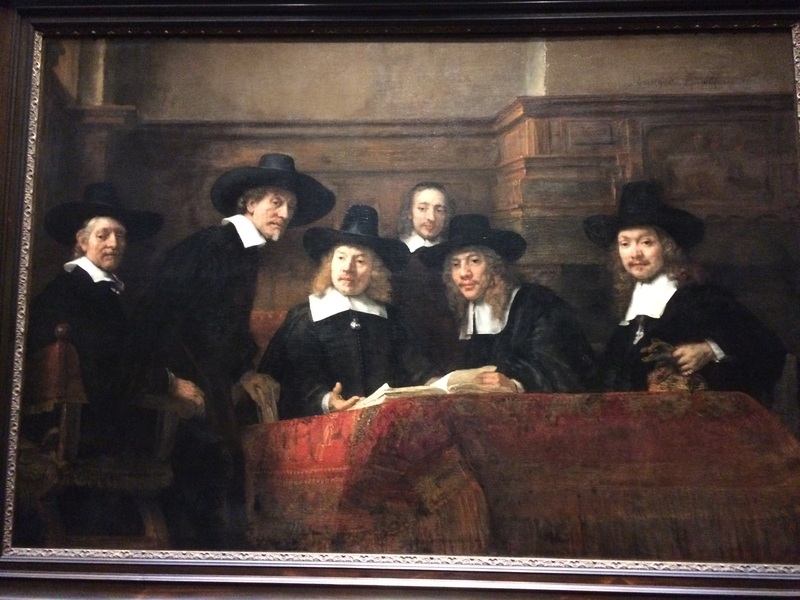 Rembrandt portrayed them looking up from their work, as though our arrival had interrupted them. 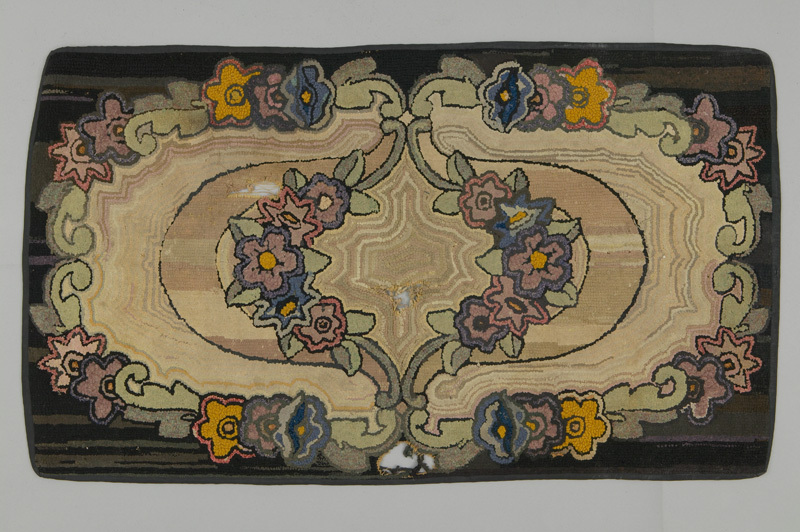 The curator’s label said this was an artistic device to involve the viewer. 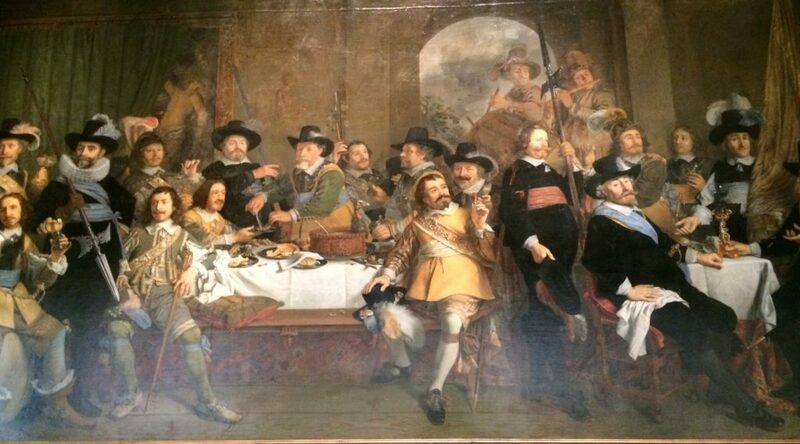 I heard one of the tour guides also point out that the table they are working at is slightly tipped up, because Rembrandt knew the painting was to be hung high up on the wall in the Drapers’ Guild Hall. 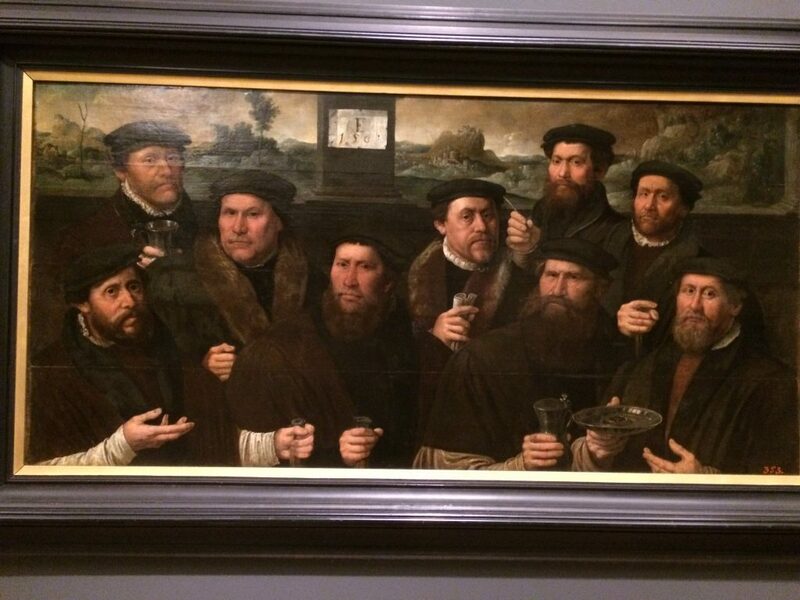 Very clever, that Rembrandt! Can one fall in love with an artist that lived five centuries ago? I think, yes. And I do get the feeling that the portraits of these men gives us a very precise rendering of what they each actually looked like. Just transporting! That is all from me for today, my head is still so art-spinning, I have to go lay down for a while! 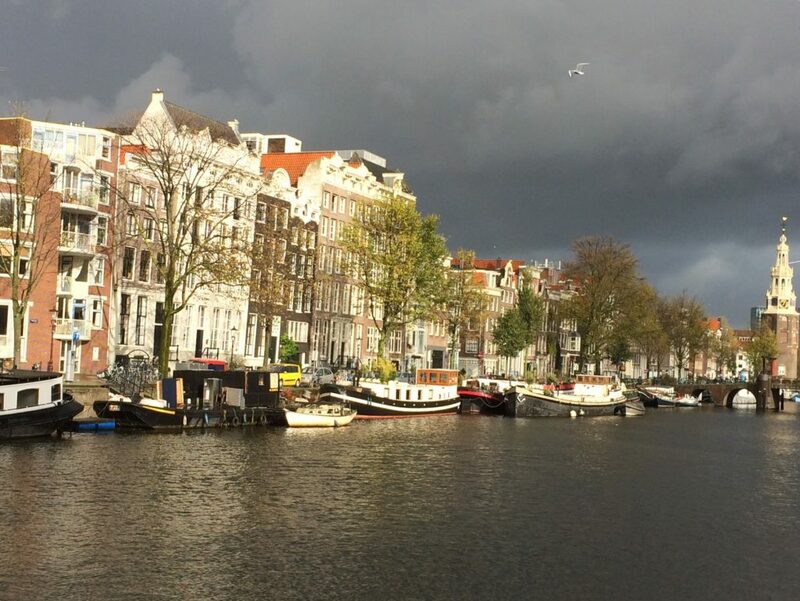 Today we leave for Amsterdam for a week. 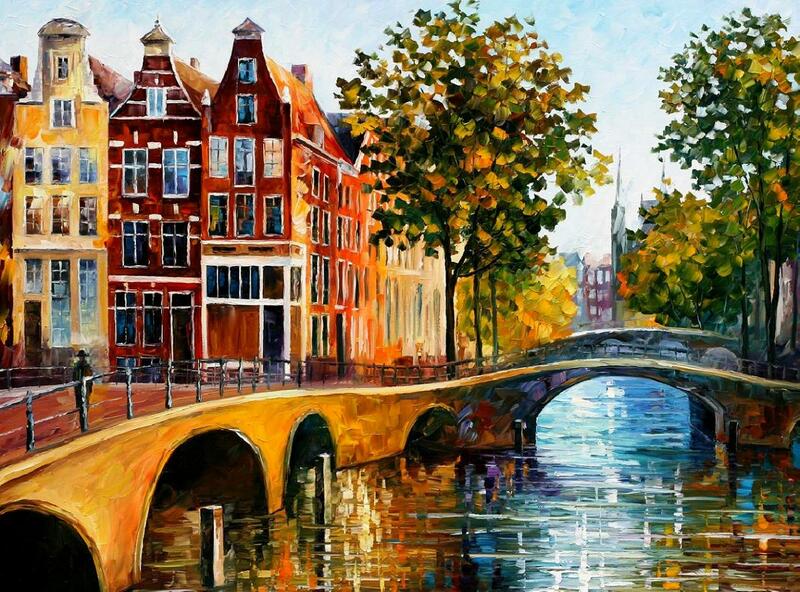 I picked this nice oil painting by Leonid Afremov titled “The Gateway to Amsterdam” to show you. This trip is really our “Ruby the cat” trip, planned a day after we lost her in July – a little consolation and to give us something to look forward to. 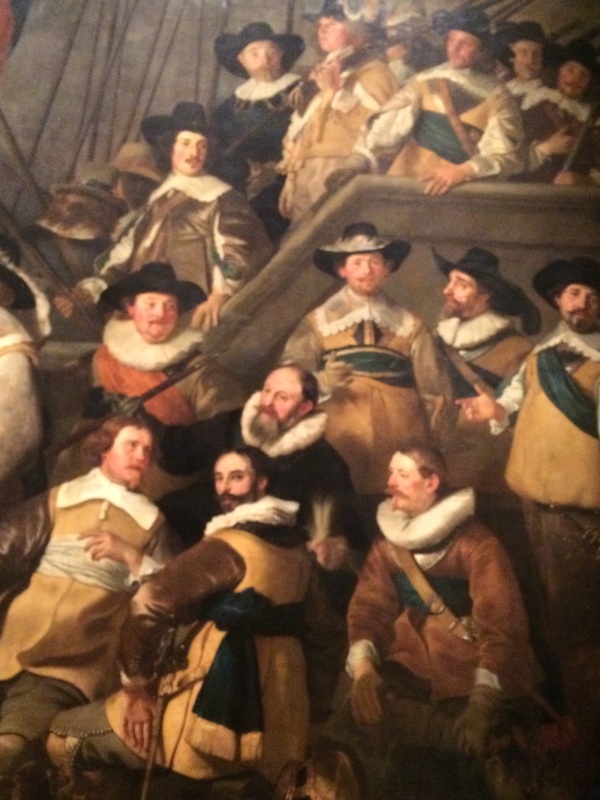 My first stop will be the Rejksmuseum, definitely one of the world’s finest art museums, packed with works by local heroes Rembrandt, Vermeer and Van Gogh as well as 7500 other masterpieces. 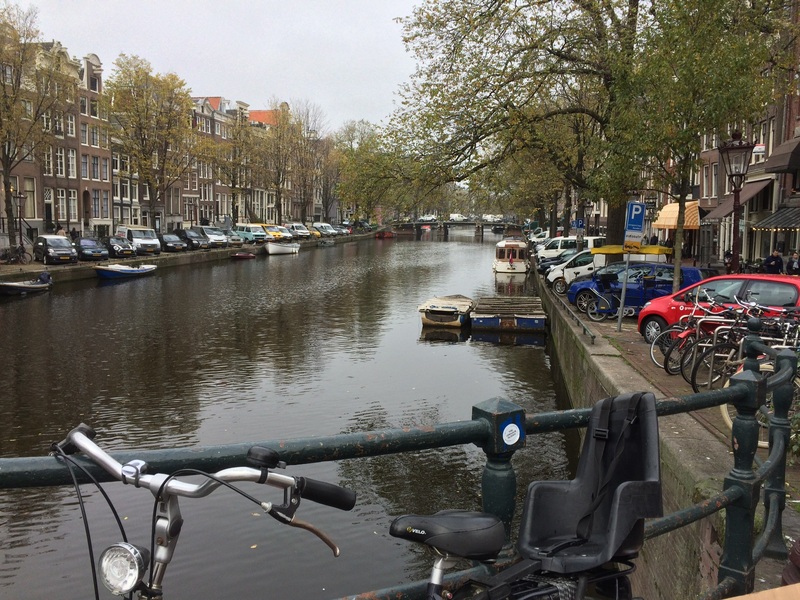 When I was in Amsterdam about 6 years ago, it was closed for major renovations, so this time, I will hope to spend a whole day wandering around, or at least as long as my legs hold out! 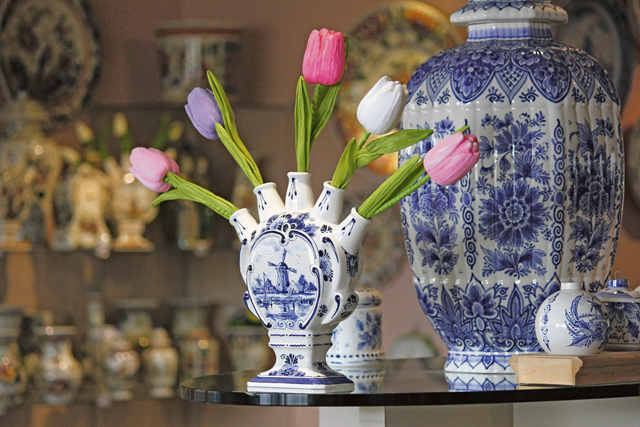 I love that they have these vases specially designed, just for tulips! So I may be in touch during my trip, or I may show you the highlights when I return. 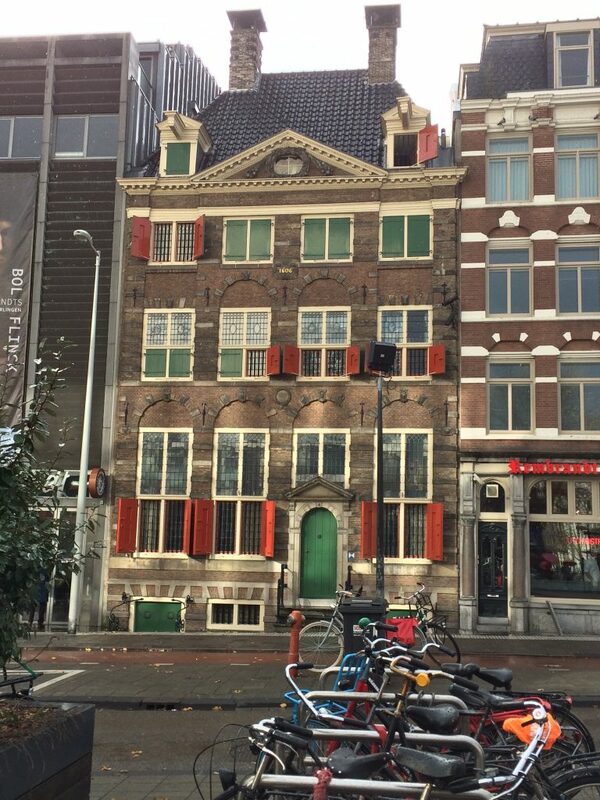 I did a search for Amsterdam rughooking, rugs, etc. but could not find anything. But you never know what surprises await! It’s coming up on Memorial Day, kids getting out of school, road trips and, hopefully, some great day trips. I am off to Sebago Lake Rug Camp (in Maine) and since I have never been to it before, there is the excitement of going to a new place as well as the always-wonderful anticipation of going off to any rug camp. I came across this photo, above, from the Belvedere Museum in Belvedere Palace, Vienna, Austria, and fell in love with the photo. 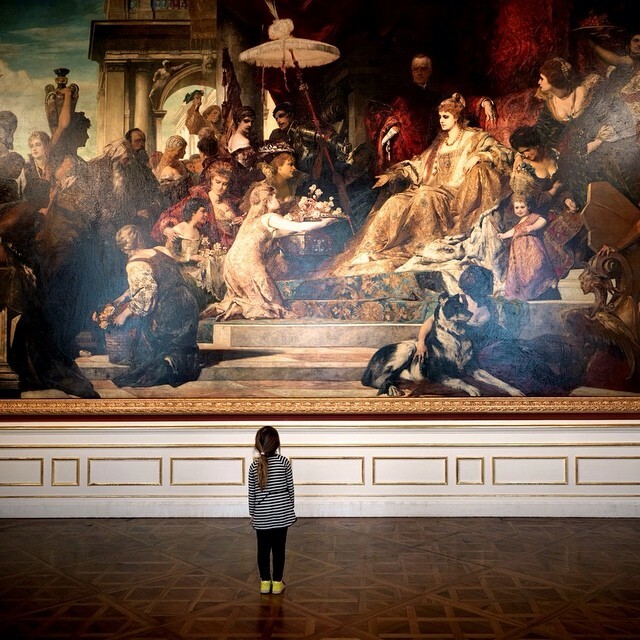 I’ve never been to that museum, but the image of this little girl encountering that larger-than-life artwork communicates the experience of seeing any museum. The magic of going through a museum is about getting out of your own usual life and experience for a little while, seeing the creations made by artists from different eras of history, how they captured the people, costumes, landscape and milieu of their time and place, trying to grasp the designs and techniques that go into any fine work of art. Just take a second look at the photo and let it sink in a bit. 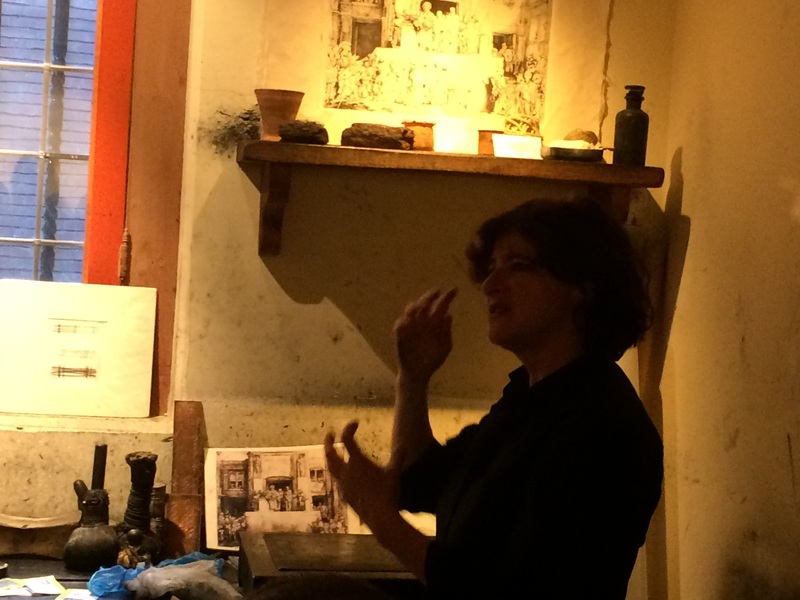 As you set goals and think of outings for your summer, do try to work in a museum or two – it is so good for all of us! And try to take a kid or two along. You’d be surprised (or saddened) at how many kids have never been to a museum. It doesn’t matter that you can’t easily get to Vienna or Rome. New England (and most states) have terrific big-city and regional museums, and most towns have little history museums, or historical homesteads. 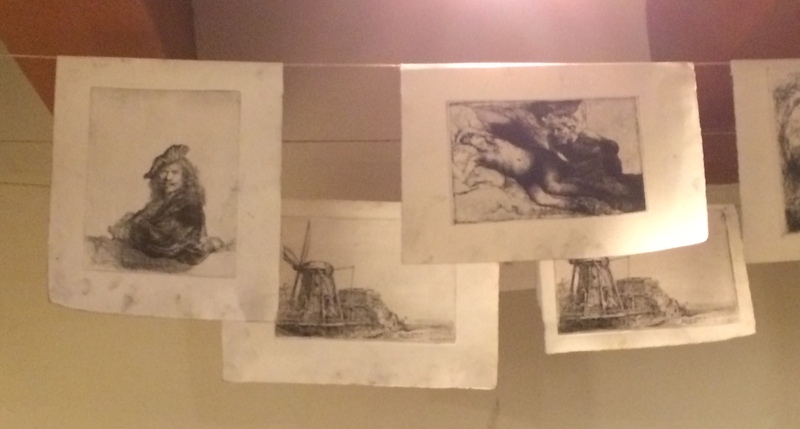 Here in New Hampshire, there is the Currier Museum in Manchester, but also the Canterbury Shaker Village, Strawbery Banke Museum in Portsmouth, and the wonderful St. Gaudens National Historic Site in Cornish. There are railroad museums and town museums, a telephone museum and a great state history museum. It doesn’t matter what sort of museum you pick – they all take us out of our own lives and time, and enlarge our perspective. 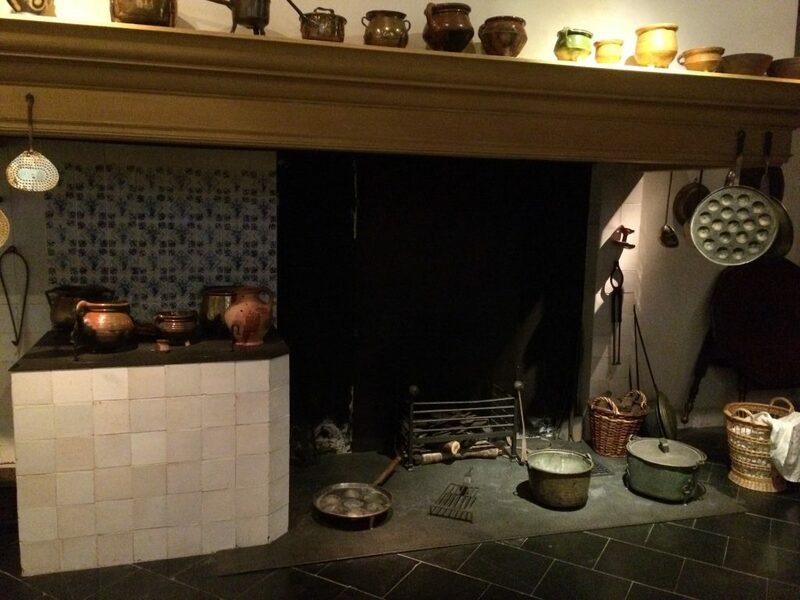 Look around for a museum, then go and, well, look around. If you are going on a road trip, google the area and see what sorts of museums are along your route. You don’t have to go nuts, just pick one, and stop to check it out. You do not have to see the whole museum. It is probably better to slow down and look at a few paintings or exhibits, instead of feeling like you have to rush through in order to see everything. Slow down. If you find yourself walking at a fast clip, giving only a glimpse and a nod here and there, you are probably tired, or have had enough. That is okay. 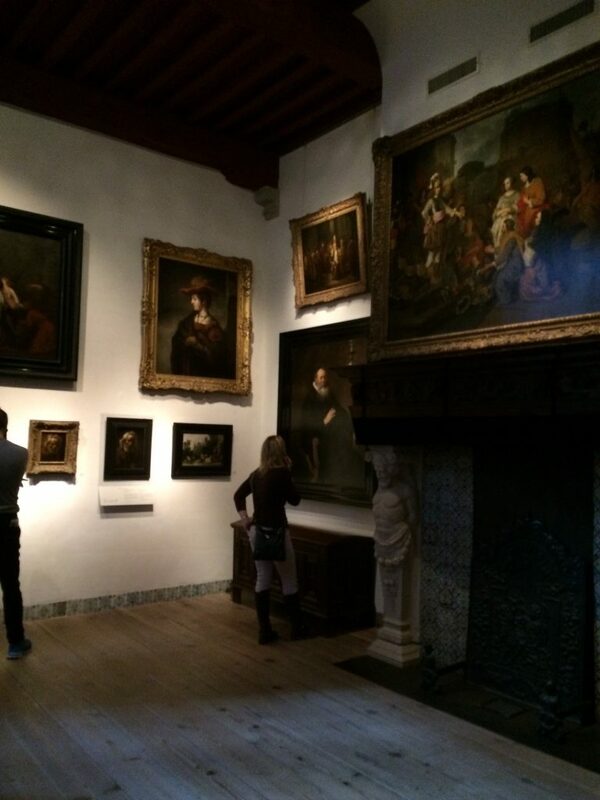 In each gallery or room, pick one painting or work (like the little girl in the photo) and just stop and look. Absorb what is going on with the lines, the curves, the diagonals – the composition. Why did he put that there? What has the artist done with the use of colors? If you could get to take home just one painting from the exhibit, which one would you pick, and why -that is, would you like looking at it day after day? 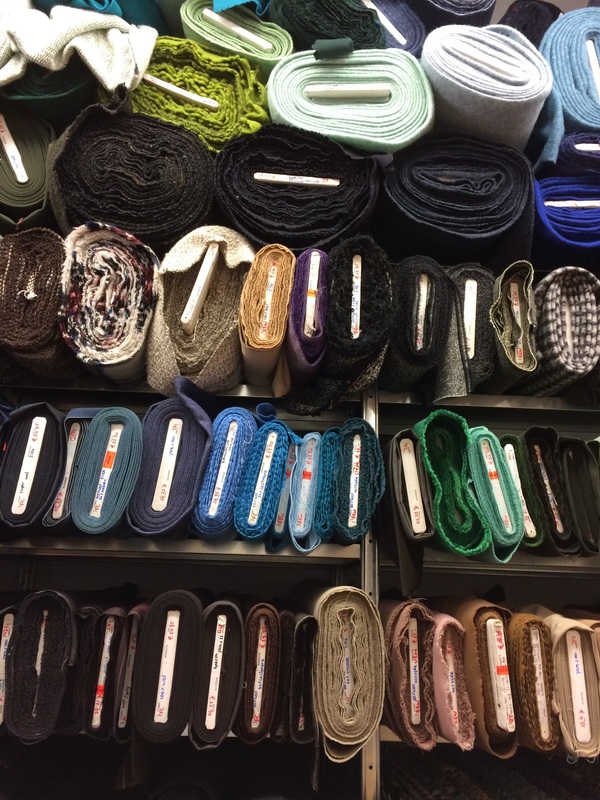 If you could choose one or two details to make into a rug design, what would you pick? Take a little notebook with you, just so you can jot down ideas. Once you start looking at creative works, often creative ideas will jump into your own mind. Catch them while you can! If you are taking kids along, once you get home, ask them to draw a picture about going to the museum, or about something they saw there. See what happens. 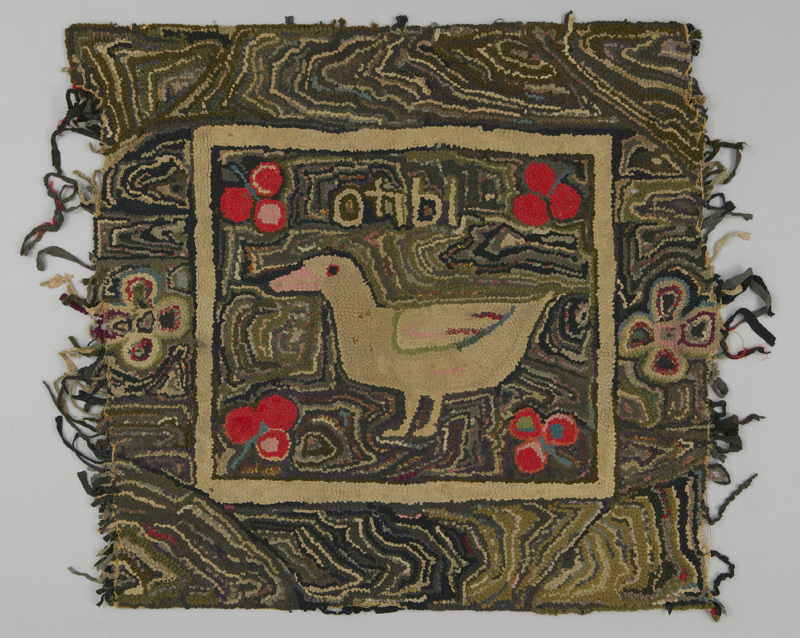 The other day I told you a little about the Textile Museum of Canada, and oddly, enough, through a completely separate search, this morning I ended up on the website of the Textile Museum of Sweden. It’s located in the town of Borås. 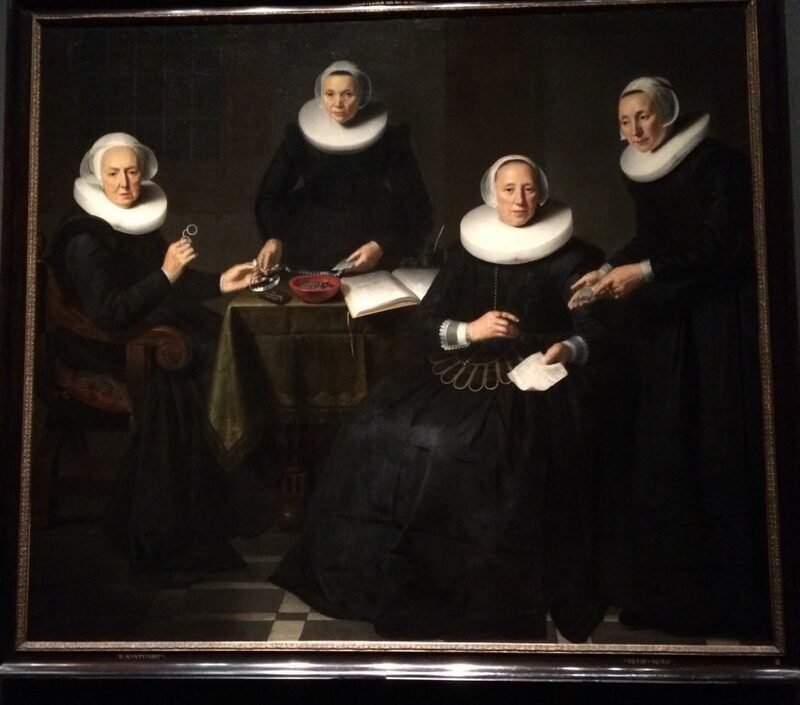 I found a photo of this work, shown above, online, and just had to track down it’s creator. 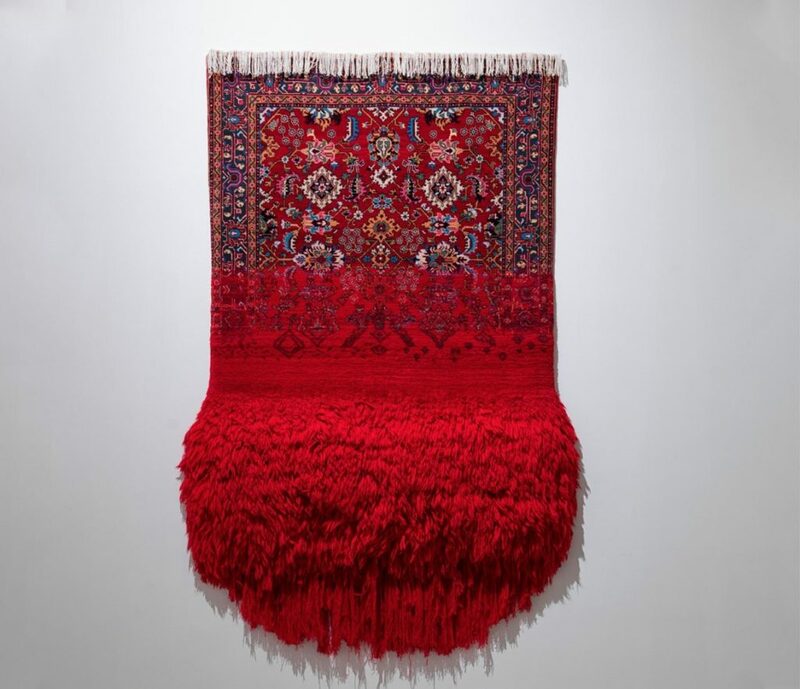 The creator of this piece is Faig Ahmed, and the museum’s new exhibit for the summer highlights the work of Ahmed, who is a rugmaker and sculptor from Azerbaijan, in the South Caucasus. Bordered by Russia, Armenia, Turkey and Iran, it is a region where hand-crafted carpets have been made for centuries. I’m not sure I can get the full gist of the cultural symbolism, but the work itself dazzles me. 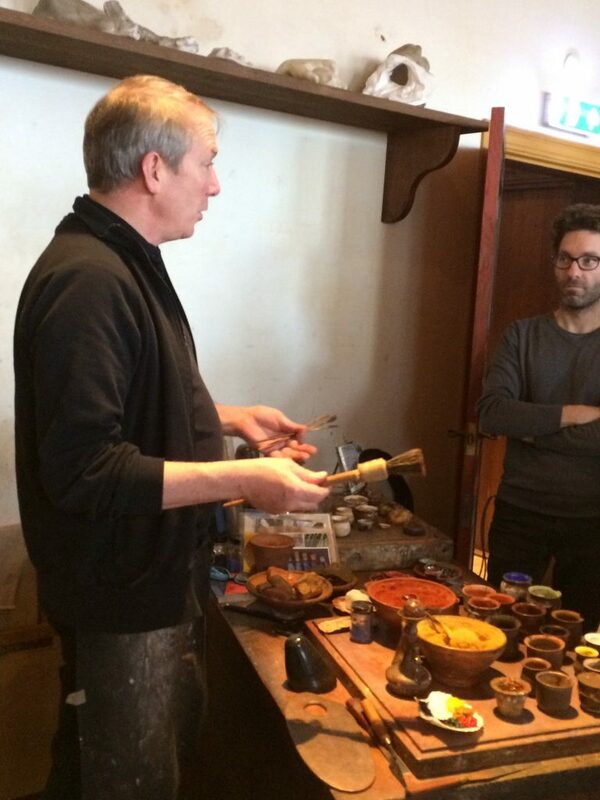 Talk about breaking borders of a traditional craft! Yikes! And here I was thinking “breaking barriers” meant something like using extra-bright colors in a primitive design! The museum’s web page about this exhibit is here. Images copyrighted ( copyright enforced), and used courtesy of Faig Ahmed Studio. The artist’s own website, featuring other works, can be found here. Enjoy the day, everyone, and be brave. 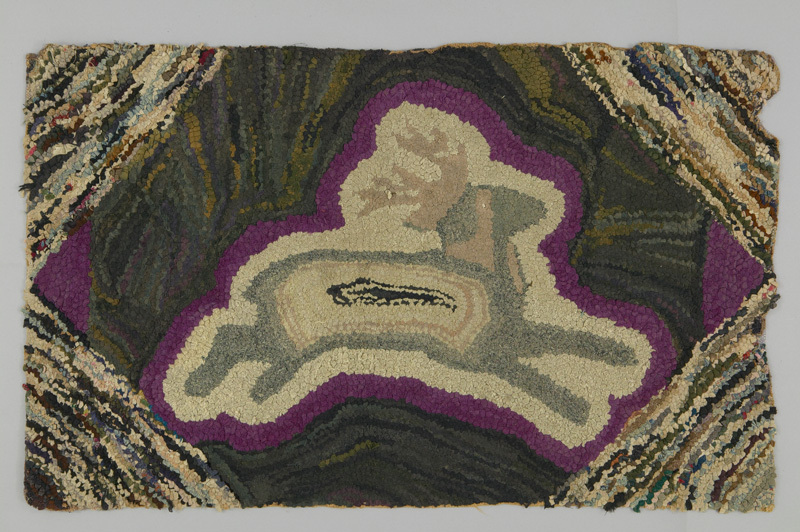 A while back, I browsed through the online collection of hooked rugs at the Textile Museum of Canada, and of course found some beauties. 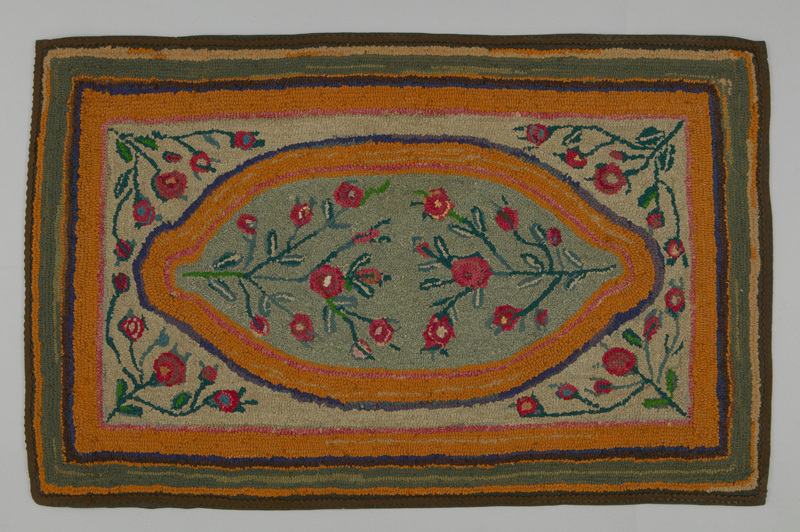 Above, you see a rug dated 1925-1935. The maker is unknown, but it was made of synthetic material on burlap, on Prince Edward Island. 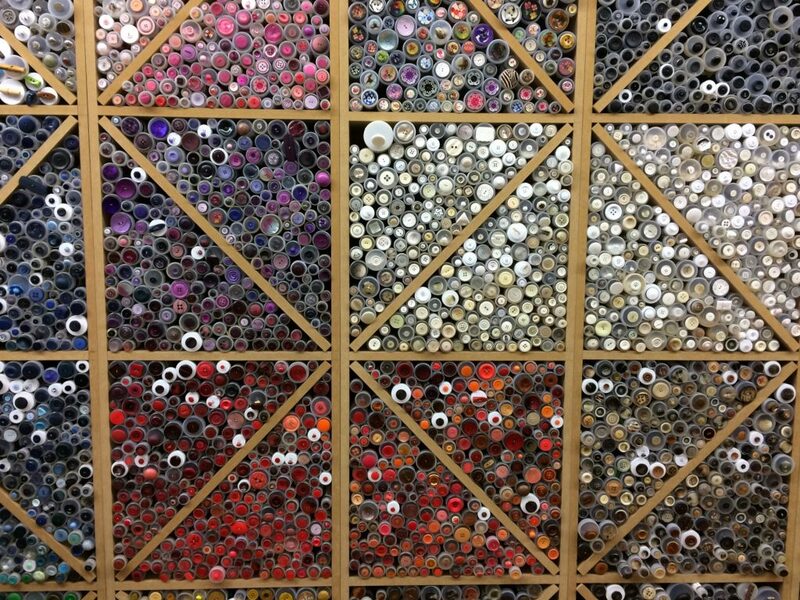 All photos courtesy of the Textile Museum of Canada. “Renowned for its comprehensive collection of work that captures “5,000 years of art spanning all cultures and time periods,” New York City’s world famous Metropolitan Museum of Art has recently announced that 375,000 of its pieces in the public domain are now available without restrictions. 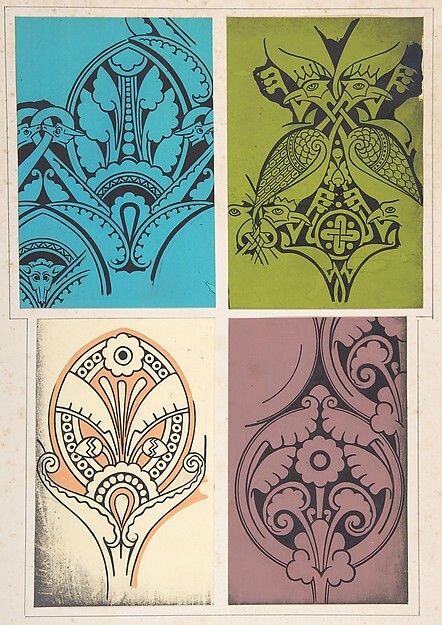 Any excuse to take a few hours off from politics is a good idea, these days, and meandering through the “Public Domain” artwork on the museum’s website, imagining how one could use great pieces of art as a rug design, is just good for the soul. 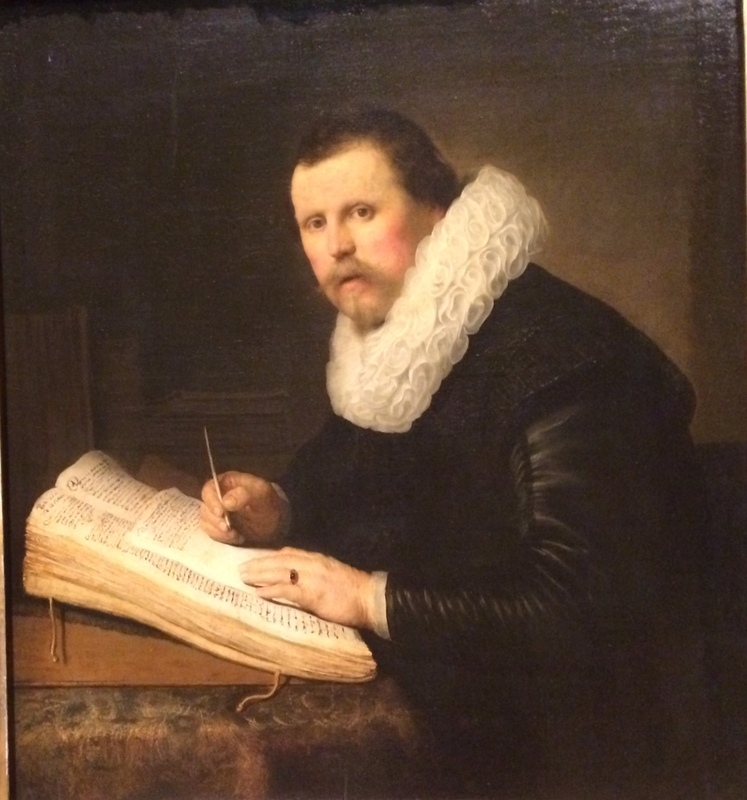 Just go to metmuseum.org. 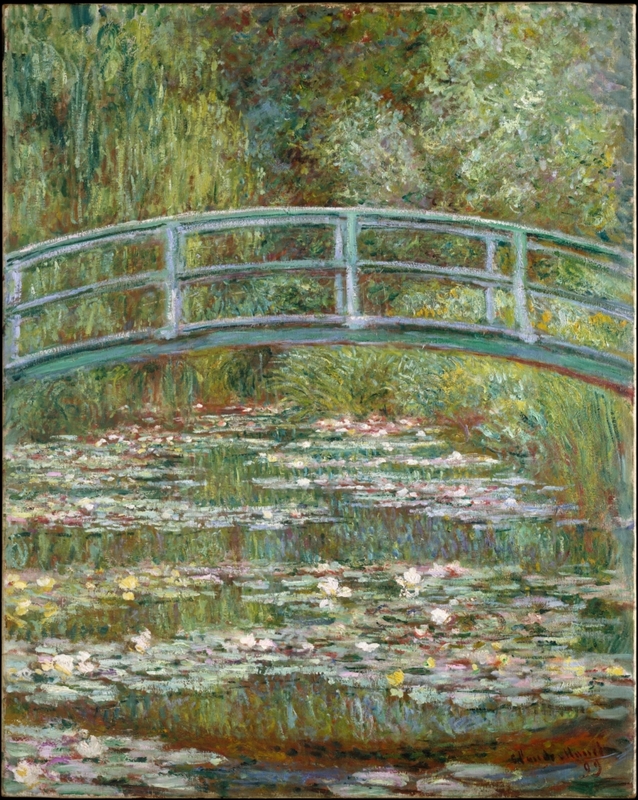 Look for the “ART” menu button at the top, then on the left side, choose these filters: “Artworks With Images” and “Public Domain Artworks”, and you are good to go. Well over 375,000 images in every conceivable medium and period of art history will appear before you. 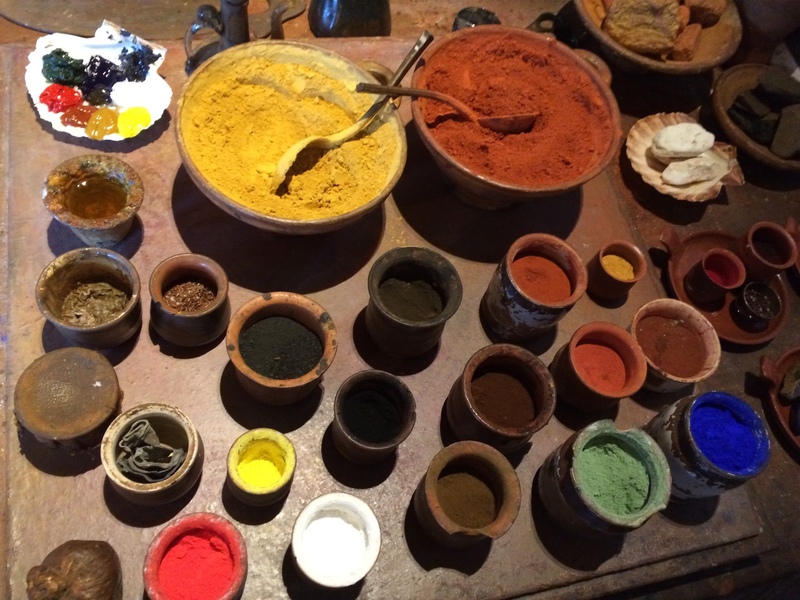 You will find brooches, medieval armor, portraits and pastels, ancient weaving fragments, silverware, sculptures, photographs, watches, netsukes, hieroglyphs, statues and shoebuckles, just to name a few. 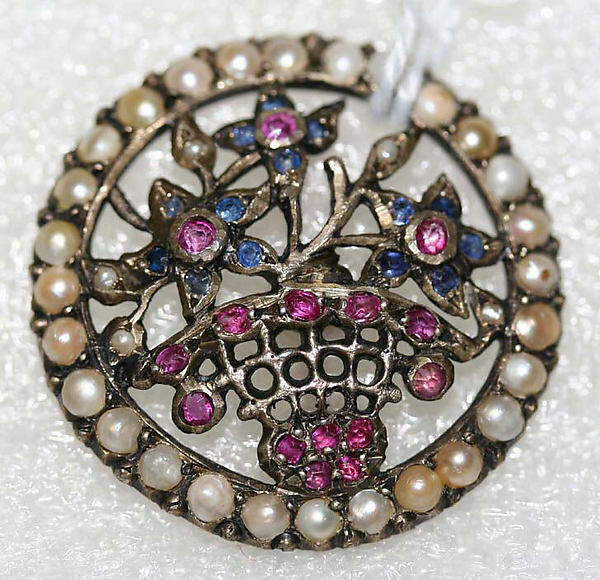 Of course, this button was worked in metal, rubies, sapphires and pearls, which adds a little dazzle. 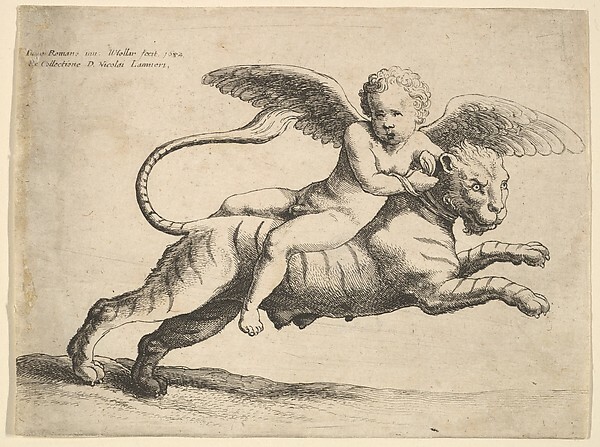 And although all these images are now in the public domain, if you use one directly, I personally think your tag should read “based on a… by (name of artist) from the Metropolitan Museum” just to be fair. And if you are just informed by a particular artwork, I believe the right tagging would be “inspired by…”. Through this new release of images into the public domain, you need not just be inspired by a work. You can take it, print it out, make a copy, trace it exactly. But first, of course, you have to look. Hope you go exploring, and find many wonderful things. 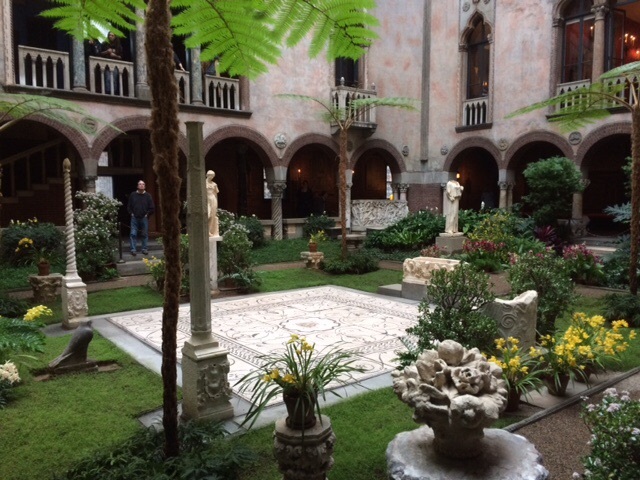 I know I just wrote a post this morning, but we are in Boston for a long weekend, and I just got back from the phenomenal Isabella Stewart Gardner Museum. What a place! 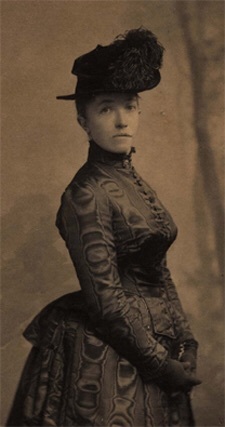 One woman spent a lifetime (1840-1924) collecting great art, built her own “palazzo” in Boston to house all her treasures, then opened it to the public, with the proviso that everything had to remain the exact way she had arranged everything. 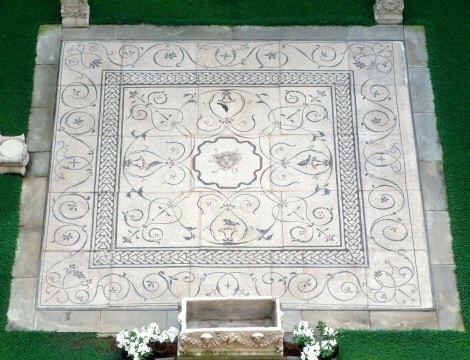 Above is a mosaic floor from ancient Rome, that graces the inner courtyard. Here’s a little bit about it: Mosaic Floor: Medusa, circa 117-138 AD, Roman (near Rome). If you go to Boston, put this unique museum high up on your list. It’s such a personal collection, and a wonderful experience. It’s dizzying in the most wonderful way. How am I recovering? I am watching a fabulous concert, “Fifty Years of the Beach Boys”, on a huge (50″?) tv in our hotel room. There’s a little dissonance between an afternoon of antiquities and “We’ll have fun, fun, fun til her Daddy takes her T-bird away”…but that’s ok. It’s all good. 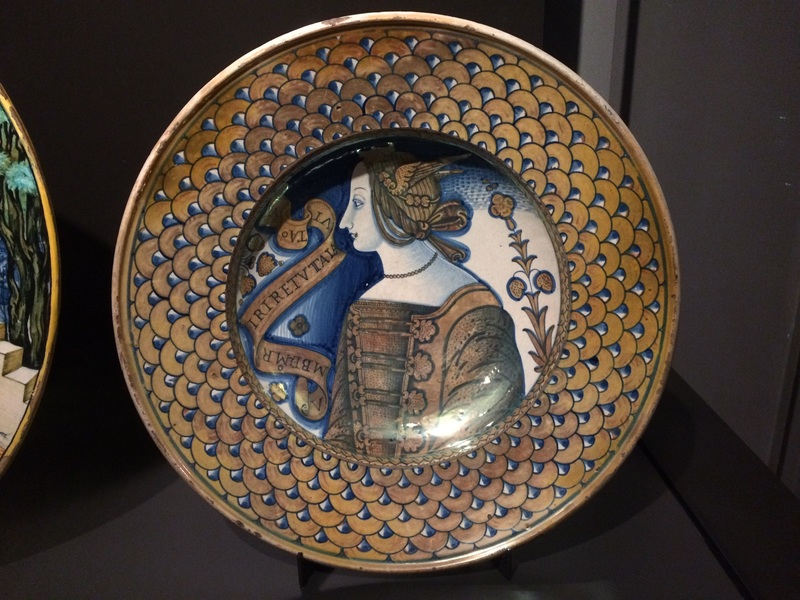 The Isabella Stewart Gardner Museum is online at www.gardnermuseum.org.